Indian paramilitary personnel carry away a fallen comrade in Srinagar on Wednesday. 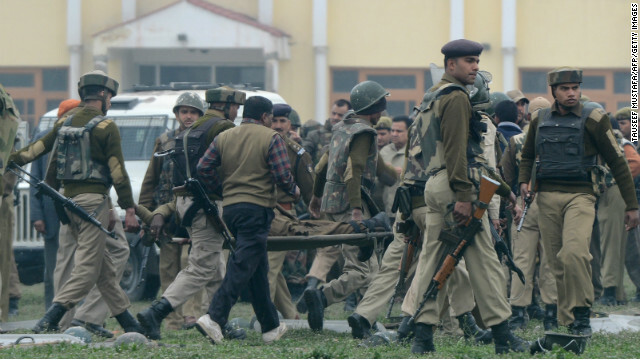 Militants killed five Indian officers at a police training camp in Indian-controlled Kashmir province on Wednesday, police said. It was the first attack in the city of Srinagar in at least three years, CNN's sister network IBN reported. It comes a month after the execution in India of a militant from Kashmir, who led an attack on the nation's parliament in 2001, killing nine people. Brutal Indian military rule of that state, 70,000 plus Kashmiris killed. UN resolutions for self determination by Kashmiris scorned by the Indian govt during past decades. Why should that bother us Americans? Very reason CNN or main stream media never covers that aspect. Why offend the powerful India ? According to human rights commission an investigation in 2011 showed over 2,700 bodies were found dumped into unmarked graves, which is a clear indication of Indian's ethnic cleansing of the people in Kashmir.